Inside Out is the brand name for a number of regional television programmes in England broadcast on BBC One. Each series, made by a BBC region, focuses on stories from the local area. Commissioned by BBC One controller Lorraine Heggessey, the programme began on 9 September 2002 and replaced a number of different titles previously used on BBC Two. Inside Out East Midlands – Presented by Marie Ashby. Inside Out England shows selected stories from the regional programmes and is shown across England which is hosted by Matthew Wright. a A different region is selected each week for broadcast on BBC One HD. The East Midlands edition of show caused controversy in one programme when Ray Gosling admitted to smothering a former lover who had AIDS (this later proved to be false). The programme was filmed in December 2009 and only shown in February 2010. A debate if the BBC should have told the police before the programme aired followed. The BBC was also accused of promoting assisted suicide. In January 2013, the writer and presenter Chris Geiger investigated a self-styled spiritual healer who claimed to be able to treat cancer using a special diet. Chris Geiger, who claims to be cancer survivor himself, used a hidden camera and posed as a client; again this programme provoked widespread debate. 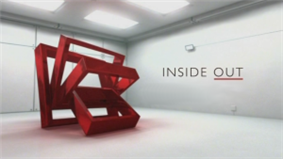 ^ "Regional current affairs move to BBC ONE - Inside Out launches on 9 September". BBC Press Office. 30 August 2002. Retrieved 9 January 2010. ^ Blake, Heidi (22 February 2010). "BBC accused of 'incredibly zealous' campaign to promote assisted suicide". ^ "I wrote the book on surviving cancer ; Irish Examiner". Retrieved 27 January 2014. ^ "Home of cancer claim spiritual healer attacked". ^ "Chris Geiger: I went undercover to expose cancer claims". ^ "Spiritual healer advised 'cancer sufferer' to drink cabbage juice". ^ He deserves to have cancer': Anger of spiritual healer exposed by BBC for charging £280 to disease sufferers for recommending cabbage diet as treatment"'".